Duncan Jones is having a year. Earlier this summer, critics scorned Warcraft, the Moon and Source Code director's foray into mega-budget video-game adaptations, while US audiences looked the other way -- the movie made a meager $47 million in the States (despite breaking box-office records around the world). Add the birth of his first kid, just days after the movie's premiere, and the death of his father, David Bowie, back in January, and that's a lot of life to shoulder. But Jones is marching on; he phones me from Berlin where he's location scouting for the Blade Runner-esque Mute, which sounds more like a spirit journey than a fourth feature. Here's the thing: Warcraft works. The chronicles of Durotan the orc warrior, Anduin the human knight, Medivh the conjuring wizard, Garona the lethal hybrid, and Gul'dan the villainous orc warlock (warlorc?) pulsate like the pages of a flip book. Jones authentically translates video-game action to the screen, owning the color, the craziness, and the cacophony. Once upon a time, the Warcraft game designers may have harvested J.R.R. Tolkien for inspiration. The movie version blows past the ingrained images like electricity out of a mage's fingertips, not original, glowing vibrantly in a sterilized summer season. So why was Warcraft one critic's "amusing and sometimes visually arresting absurdity" and another's "Battlefield Earth of the 21st Century"? I asked Jones to take one more look back to understand if the CGI-heavy epic was destined for what it became: the most underrated movie of the summer. How much of your life did you invest into Warcraft? Three and a half years. [Mute], from start to finish, will be one year. It's all about the decision-making process. When you make a studio film it's a bit like you're the captain of an oil tanker. If you want to make a turn it's going to take a lot of effort. When you're making an independent film it's more like you're driving a motorboat. To use your freighter metaphor: what was the biggest turn you made on Warcraft? When I got involved there was an approach to the film which was more "humans are the heroes and the invading orcs were the bad guys." It didn't ring true to me as to what the Warcraft game is. As someone who is familiar with the game, it really mattered to me that that element of it was accurate. I think being able to make the orcs more human, up their screen time, and balance the audience empathy for those orc characters was all something that felt absolutely crucial to me. I was fortunate that I was able to convince the powers that be that that was the right thing to do. 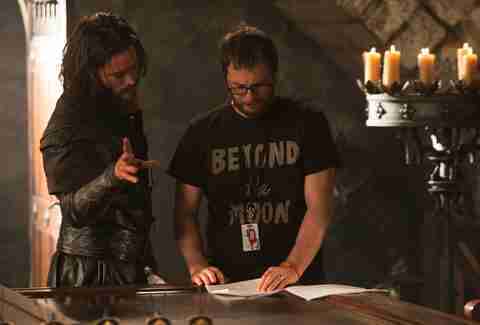 There were a lot of gravitational pulls in Warcraft in particular, even more than a standard studio movie. Obviously, Blizzard, [the company that] makes the game, makes vast amounts of very well-earned money on its games, so it was important that whatever we did didn't pollute them. What I pitched was so more in sync with what the game's company hoped the movie could be after many years of trying to make the movie. I think that's what gave it an awful lot more momentum and allowed me to convince the studio that if they wanted to make a movie based on Warcraft, this was the way that both I and Blizzard thought it needed to be. Was doing the game justice a risk? It's been really unusual and challenging to parse exactly what makes the film work for certain audiences. There is no clear and defined group of people who likes Warcraft. There are young men and old men who like it. There are kids who like it. There are women, young and old, who like it. And pretty much all of these demographics evenly are split between people who know the game and people who know nothing about the game. There are older women who know nothing about Warcraft, large numbers of them, who love the movie. Warcraft is robust with mythology and mystical language. How do you know what a mainstream audience can absorb? I would refer you back to Star Wars and the names of the characters in that. Han Solo -- if you met him on the street you would probably find that to be a slightly odd name. Luke Skywalker, again, a little odd. Lothar, well kind of odd, but not that odd. If you go to Lord of the Rings it gets even crazier. I've had this discussion and it has been publicized with people before. If you knew nothing about Lord of the Rings and didn't read the books and you went to the movies, you could still enjoy it without knowing much at all about the geography of Middle Earth or what the races are. It just depends on where your suspension of disbelief is and where you're able to take that leap from. Warcraft made loads of money in China. China was awesome, obviously. It's still a hotbed of Warcraft-playing. We actually had incredible success in most of Europe, too. The UK, similar to the US, got down on the film fairly early on. But in Russia, Germany, France, Spain, pretty much any European country, and in China and Korea, we did incredibly well. A lot of people like to quote the numbers that we did in China but we did just as much money and the rest of Europe. It made good money around the world and was really enjoyed around the world, too. I think there might have been an element of cynicism. There's a condiment that you can put on toast in the UK called Marmite. Their advertising campaign is that you either love it or hate it. I think Warcraft has a similar history in that a lot of guys and girls out there have had their relationships broken up because their significant others played too much Warcraft or for whatever other reason they don't like Warcraft because of a rivalry with another game they prefer. I know that the movie is not perfect and I think one of the absolute frustrations of making a movie of this scale is that it is impossible, I think, to make a movie like this as an independent filmmaker. You have to find a way to squeeze it through the studio bureaucracies. You fought through a lot. Trying to make a movie like Warcraft, and trying to do it in a unique way... you get killed by a death of 1,000 cuts. Not just editing cuts. It's little changes that seem really innocuous. As a filmmaker the only way that I understand how to make a film is holistically. Every choice that I make, whether it is story or character or costume, all works together. When you make a little change it doesn't seem like a big deal. When you keep making those little changes, especially over three and a half years, suddenly you're basically spending all of your time trying to work out how to patch up what has been messed around with. 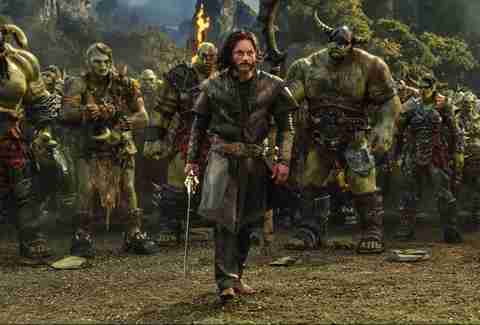 How did you imagine Warcraft standing apart from other fantasy films and TV shows? Through the world-building element, as far as creating something which was slightly more hyper-real than the more realistic depiction of a world that you would get in Lord of the Rings or Game of Thrones where there's this monochromatic, slightly grim reality to it all. It's great and it looks cool and the first time I saw that I thought it was amazing. The more I see fantasy films aping that, the more I wish somebody would try to do something else. I've seen that now. I think our attempt to create this more hyper-real world where landscapes feel compressed and you look across a landscape and [immediately] go from forests to mountains to snow-capped peaks. It was a novel in different way of approaching it. It felt much more true to what the game is in Warcraft where you go from one terrain to another and you do it over the course of a couple of steps. It felt both true to the game and it also felt like we were depicting a fantastical world in a different way. Elements changed, but what did you manage to protect until the end? I was able to maintain Durotan and Draka's relationship, keep it feeling like a real relationship between a husband and wife, and those two characters being orcs. That was something that I pitched right from the start, and fought hard for, and was able to keep that in there. That always felt like a real win. There must be an action sequence you think lives up to your vision, only because I was thoroughly entertained by them. I think the first forest fight is a lot of fun. There's a structural juggling act that we do that I don't think people give enough credit to: in [the end] of the film we bounce around between Durotan fighting Gul'dan; we've got King Llane charging into the orc camp and the turn of events with Garona at the same time; and we've got the golem and Lothar and Khadgar having their fight with Medivh. We're juggling a lot and it works really well. A lot of people have criticized the jumpiness of the pacing. Trust me, if anyone is frustrated about the pacing of the film and how that turned out, it's me. It's not because I didn't know what was happening, but as I said, death of 1,000 cuts. 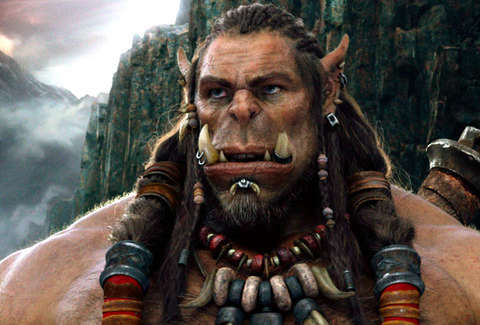 Is there a three-hour version of Warcraft? No, there's not. A lot of people ask me, "When is the director's cut coming out?" There will never be a director's cut. With a film like this, where there are so many visual effects, every concession that you make you lose those shots. They cease to exist because the effects work never gets done. Some of it's not even at that stage. You go through a writing stage right up to the deadline of shooting the thing. [You lose] ideas in the writing process. Then sets change for whatever reason and notes come in. You're changing things around a three-and-a-half-year process. You get these little changes which are constantly course-correcting you. So there is no possibility of there ever being a director's cut. It's purely in my head. There's talk of a sequel. Would you want to make it? If there were an opportunity for us to make another film in the Warcraft universe I really feel like we did the hard work in the first movie as far as setting the table. I would love to capitalize on three and a half years of hard work and be able to have some fun in that world now that I've done the hard work. [So] who knows? Maybe I'm just being a masochist. Now you're in Berlin prepping Mute. You didn't take a break. Mute is massively therapeutic for me. It really is. I'm equally proud and furious about Warcraft. I love it. I spent so much time on it. I put all my heart into trying to make it work. Parts of it, I think, work, but it also drives me crazy that I wasn't able to push through everything that I knew needed to happen in order to make the film I knew it could be. Matt Patches is Thrillist's senior Entertainment editor. He previously wrote for Grantland, Esquire.com, and Vulture. Find him on Twitter @misterpatches.